HOUSTON, January 29, 2007  A monograph highlighting 20 years of work by artist Lydia Bodnar-Balahutrak has been published by Sofiya-A Publishing in Kyiv. The 112-page hardcover, large format (11” x 9”) book features text in English and Ukrainian, introductory essays by art historian Myroslava Mudrak, Ph.D., and over 100 color reproductions of selected artwork. The book is one in a series of artist monographs dedicated to artists of Ukrainian heritage living and working outside Ukraine. The series (collectively titled “Testimonies of Spirit”) was spearheaded and edited by Mykola Marychevskyy. Lydia Bodnar-Balahutrak was born and raised in Cleveland, Ohio. Her parents immigrated to the United States from Ukraine after WW II. She studied art at Kent State University, Ohio, at the Corcoran School of Art, and in 1977 received her Master of Fine Arts degree in painting from George Washington University, Washington, D.C. In spring 1991, an IREX grant enabled her to travel to Ukraine for the first time as a guest lecturer at the L’viv Academy of Art. In 1993 she participated in a two-month International Artist’s Symposium held in Ukraine. She won the Creative Artist Program Award in Visual Art from the Cultural Arts Council of Houston with her “Fragments” series of works on paper that dealt with aspects of the 1932-33 Famine in Ukraine and the 1991 dissolution of the Soviet Union. Three years later she was a visiting artist at the Art Academy in Kyiv and had the unforgettable opportunity to tour the Chornobyl Zone. In 2006 a selection of her mixed media work was featured in a solo show titled simply “Chornobyl” at the Art Gallery of the University of Houston/Clear Lake, marking the 20-year anniversary of the Chornobyl nuclear accident. Dr. Mykola Marychevskky is the editor of this book. The late Dr. Marychevskyy was the longtime editor-in-chief of the Kyiv publication Fine Art ( Obrazotvochre Mystetsvo ) and the founder/editor of Artania, a quarterly cultural arts magazine. He had traveled throughout Eastern Europe, the United States and Canada and lectured on topics dealing with contemporary Ukrainian cultural issues. A memorial presentation of his published projects, including this monograph series, took place in Kyiv in 2006. Myroslava M. Mudrak, Ph.D., professor of art history at Ohio State University, contributed the featured essays in the monograph - one in English and one in Ukrainian. Each essay has distinctive emphases, gives insight into the artist’s thematic and aesthetic concerns and outlines her multi-faceted exploration of cultural identity. Dr. Mudrak is a highly respected and widely published specialist in 20th century and contemporary art of Ukraine and Eastern Europe. She lectures extensively and contributes essays to numerous scholarly publications and exhibition catalogues. Interspersed throughout this book are excerpts of previously published art reviews and articles. They accompany images of referenced artwork. Among the selections, “About Drawing”, an edited essay by art historian and Houston-based writer Donna Tennant, investigates the artist’s draftsmanship. In “About the Boxed Series”, Melana Zyla Vickers, a writer based in Washington, D.C., muses about the artist’s visual wordplay in her miniature assemblages, the final art series represented in the book. Included also are the moving thoughts of Oksana Bryzhun-Sokolyk, written after her unexpected encounter with the artist’s work in a Dallas gallery, and a transcribed 1985 interview with journalist Peter Fedynsky for a radio show which was broadcast by Voice of America throughout Ukraine. The graphic design of the book is the notable work of artist Petro Bevza. He incorporates informal photos of the artist with family and friends into each chapter heading and table of contents page, providing an effective visual and narrative introduction to each section. The material is presented chronologically, beginning with the artist’s move to Houston, Texas where she still resides with her husband Michael. Her first time trip to Ukraine with him in 1991 serves as the mid turning point in the chronology. An account of her memorable visit introduces the ensuing artwork. The earlier work is figurative painting and drawing. After 1991, she embraces collage, assemblage, and a mixing of media. The book closes with the artist’s biography and bibliography. 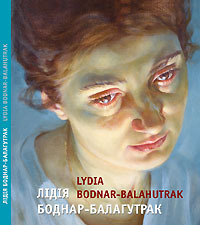 The book Lydia Bodnar-Balahutrak / Лідія Боднар-Балагутрак is currently available for purchase at $40.00 (US), including shipping and handling. For orders of 5 or more books, there is a 20% discount. To receive the book(s), please include your mailing address and send a check made out to the artist, Lydia Bodnar-Balahutrak, 2476 Bolsover # 517, Houston, Texas 77005. The book will also be available at selected bookstores, museums, galleries, and online venues. Check the artist’s web-site: www.LydiaBodnarBalahutrak.com for more information and updates.